It was time for Round 4 of the Marx Food Ridiculously Delicious Challenge. The remaining ten contestants were going to be shipped a highly secret and highly perishable ingredient that we were supposed to use in a highly awesome recipe. Needless to say, it was all highly nerve wracking. My Twitter friends Joanne, Brian, and I spent many tweets (unsuccessfully) guessing at the secret ingredient. And then, I opened the box to find myself staring at what looked like armed ginger. Green armed ginger. I shook the box frantically, hoping against all hope that this was the just-kidding secret ingredient and the real secret ingredient was still inside. But all that fluttered out was a piece of paper with an introduction. Turns out the green armed ginger was actually a Daruma Wasabi Rhizome. Oh good, glad that cleared things up. I thought about those darn rhizomes all last week. When I was researching grounds of inadmissibility for a case, I was actually thinking of rhizome recipes. While I was walking to court, I was ruminating on rhizomes. And when I met with clients, I was contemplating my upcoming rumble with the rhizomes. And after a particularly busy week at work where my only break every day was a glamorous lunch of ramen out of a styrofoam cup, all I wanted was some comfort food. It would be fried. There would be sauce involved. Oh, and I'd eat it watching missed episodes of the Jersey Shore. Luckily, I had some Marx Food Alaskan Spot Prawns, the spoils of the last recipe throwdown. But when I went to fry 'em up, I felt those darn rhizomes calling me. Granted, it could've just been the delirium from the work week setting in but I've never been one to turn down the call of food. So I grabbed the wasabi, grated it up, mixed in some salt and pepper, and massaged it onto the shrimp. I dusted the shrimp with some flour, gave 'em a quick egg-wash bath, panko'ed 'em up, and fried 'em until they were golden brown. They were good. Really good. But they needed a sauce. I quickly concocted an avocado-wasabi dipping sauce, dunked a shrimp and then another, and another. I would've eaten the entire batch of shrimp standing by the stove but I had waited all week to find out the latest happenings on the Jersey Shore so I dumped my shrimp on to a plate, grabbed some sauce, and the remote control and ate on the living room couch like a civilized person. And you know what? The Wasabi Fried Shrimp with Avocado-Wasabi Sauce were definitely fist pump worthy. 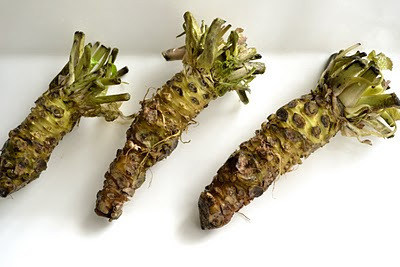 PS: I figure it's only fair that I spread the wasabi love so I'm sharing my remaining rhizomes with some local blogger and foodie friends, including the fabulous Food by Z. Can't wait to see what they come up with! Peel and devein the shrimp, but leave the tails on. 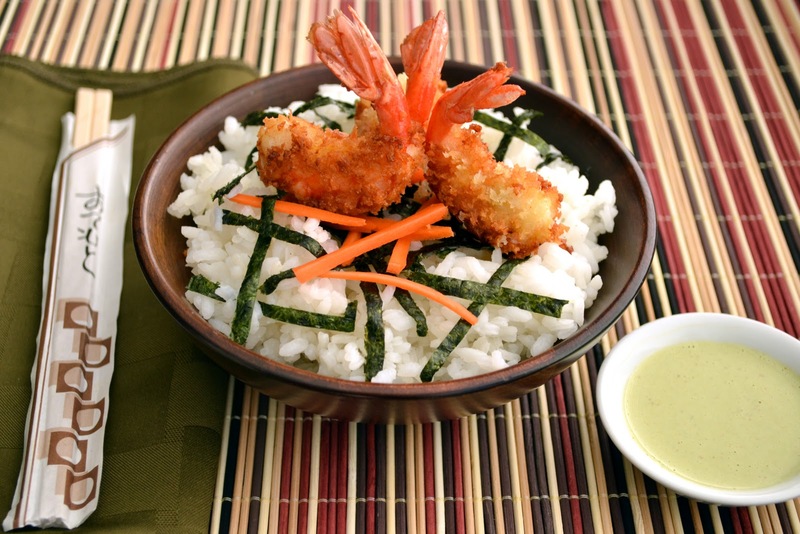 Mix grated wasabi, garlic powder, salt and pepper in a small bowl and massage on to the shrimp. Dust the coated shrimp with flour to ensure the wasabi crust adheres. Dip each shrimp in egg wash and coat with panko. 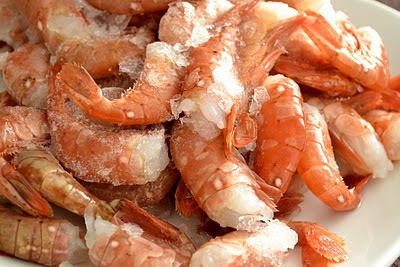 Fry until shrimp are golden brown. Mix all ingredients together thoroughly until you have a thick sauce. Thin out the sauce with some water, until it's a good dipping consistency. Thin out with more water if you want it to be a more pourable consistency (delicious when poured on fried rice. Not that I would know from experience or anything). Wow..thats so innovative of you..great recipe..sounds super delicious n yummy...anything fried sounds great to me..:)..thanks for sharing..have a nice week ahead! I could eat fried shrimp for days straight. And with wasabi? Fabulous. Well done! I bounced the little trees around on my desk for an hour, in dis-belief! Your shrimp look great, and I love the spicy mayo! What on earth? Rhizomes? I have never heard of such a thing. You are amazing! Not only did you not panic but you figured out what on earth to do with what I assumed were mini-palm trees! I love what you came up with, especially the dipping sauce. It looks fabulous!! Love the spicy touch to the shrimp and mayo!! You had me at shrimp! Shrimp is the only reason I can never ever call myself a vegetarian. What? Say again? All have known is wasabi in the tube. And to be honest I love wasabi but I'm so pathetically uncreative with it, I don't do enough with it. Avocado wasabi sauce is totally calling my name! Azmina, I'm a huge shrimp lover and I absolutely love this dish - DROOL! I never knew that's what wasabi looked like, interesting. Loved your description of them...teehee. This is such a creative dish. Your avocado wasabi sauce is the perfect accompaniment for this. Beautiful presentation as well. delicious shrimps ...loved the spicy and mayo combo ! So would have thought avocado and wasabi can be paired so well together. I'll say it again (and again) if I have to, but you truly are a master chef! Woo hoo Azmina FTW! I've never heard of Daruma Wasabi Rhizome. It sounds interesting...and now I'm wondering how to get my hands on some. And your dish looks delicious. I haven't a clue about the ingredients you have mentioned but the prawns look awesome , I just love prawns and fried ,then it is sheer bliss . You do not watch jersey shore, right? "giggles" Hey, my nose is already clearing up just looking at the fresh wasabi. I love using it, and having it, but I can never use it all before I need to buy another one, in Japan we end up buying the pre-filled tube.. I like when my eyes cry and nose burns. Wasabi may is the BEST.. can you buy it there at the super? Seeings the only way I ever eat wasabi is with sushi, the jump over to shrimp is an easy one. It sounds amazing. The mildness of the avocado in the sauce? YUM! You last two posts make me want to go to Reb Lobster, I'm sure your food tastes much much better than that but that's how close I can get to cheddar biscuts and shrimp. Avocado- Wasabi- Mayo never tried the combination. But looks interesting. The shrimp looks perfect. Nice work, friend. What a great idea. This looks innovative and exciting! I will also fixate on either a recipe or an ingredient during my working hours, either obsessing over how delicious it will be or WTF am I going to do with said ingredient in mind. And that fixating on your part yielded such a lovely dish--deceptively simple that still features the "theme ingredient" nicely. Can I join you on the couch to eat these and watch some Jersey Shore (even though the season is over)? I'm thinking it may be a good night to take some of those halibut cheeks and coat them in bread crumbs and wasabi and fry them up! Girl, how you work and still manage to make food like this is beyond me. When I would meet with clients, all I could think of was "how many more hours to the day?!" -- let alone coming home and making a wonderful meal! I'm giving you a fist pump right now, you go girl! Oh I wish I could have a plate of this right now. I adore wasabi, and growing up in south Texas, you know I love shrimp. Thank you for sharing such a creative recipe, my friend. After such a long and hard week, it is good to visit the blogs that I love. I hope you have a safe and happy weekend. I would have been in total shock seeing at those things in my box....having no no no idea of what they are and what to do with them. You just pulled out a wonderful recipe here. You are so creative! Great job, Azmina! MMmmm! This recipe title caught my eye, and my palate! And what a beautiful pairing? Avocado and wasabi! 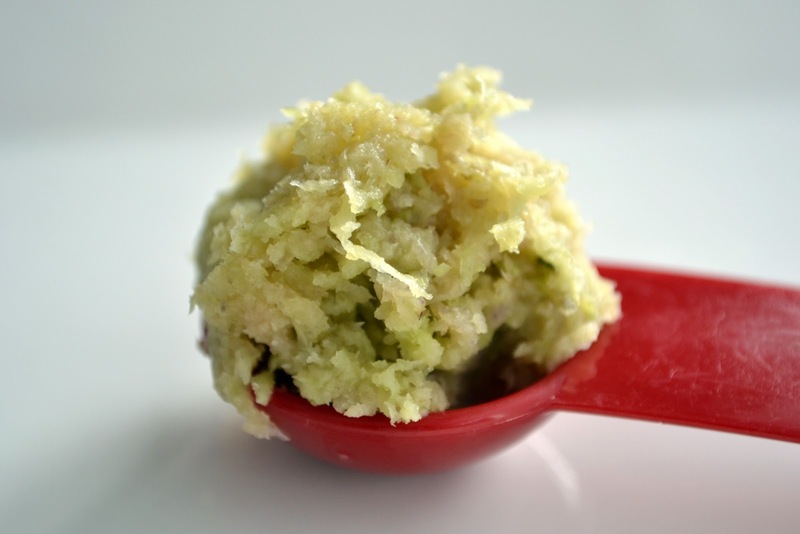 The high fat content in the avocado should really foil the bright flavor of the wasabi! Great job getting to the sofa! *Ü* You'd get my vote! Best of luck to you! You definitely won the rumble with the rhizomes! Mmmm, I can taste the buttery avocado with a blast of wasabi with every bite of crispy panko shrimp! It's always interesting to me to see the vegetables and fruit in their most natural state - I would not have guessed that wasabi looked like that. I've been neglecting the blogosphere as of late...been busy with GLT and that sort of stuff. No biggie. However, coming back I am delighted to see that your posts continue to be entertaining and mouth watering! This recipe sure as heck better advance you. Looks amazing! These shrimp sound amazing! Good luck on the contest - with recipes like this you are sure to go really far! Have a great week!! This recipe sounds so amazing to me! I like the shrimp that is being fried in wasabi! I think it is delicious! Oh so that's what fresh wasabi looks like! Those prawns look good. I'd eat them with a ton of Japanese rice!